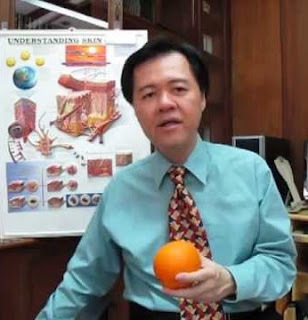 A good friend emailed me an article two days ago on "The best ways to protect your kidneys" written by a certain Dr Willie Ong. When it comes to sharing information on health and medical treatment, I always make it a point to do some research to check the reliability of the information and the credibility of the source. So that's precisely what I did after reading Dr Ong's article. It appears that the good doctor writes a regular column for the Philippine STAR. Not only that, he has a Youtube channel where he has posted several videos covering topics ranging from "How to Lower Your Cholesterol" to "Watermelon's Health Benefits". I have chosen to reproduce below Dr Ong's article "10 Ways to Protect Your Kidneys". Note: As with all health information, please do your own research as well to verify any claims, even those that are made by medical professionals. Doctors are known to disagree among themselves when it comes to recommendations and treatments! Most people know how to protect their heart (eat less fat, exercise more), but do you know how to care for your kidneys? A diabetic patient of mine thought he was healthy until a kidney function test showed that his kidneys were only functioning at 40-percent capacity. The kidneys’ job is to help remove various toxins (drugs and food wastes), and expel them through the urine. The kidneys are silent and efficient workers, but if they get sick, the whole body suffers. As we grow older, our kidneys also start to age, hence the need to protect them. Another problem with kidney disease is that majority of patients have no warning symptoms. Occasionally, some patients may notice leg swelling, which prompts a doctor’s consult. Some time ago, we interviewed renowned nephrologist Dr. Elizabeth Montemayor in our DZRH radio program Doctors on Call. Dr. Montemayor is head of the Section of Nephrology at UP-Philippine General Hospital, and an associate professor in Physiology at the UP College of Medicine. 1. Limit your salt intake. Too much salt is not only bad for your blood pressure, it’s also bad for your kidneys. Many Filipinos die of kidney disease, which can be partly attributed to our high salt intake and fondness for fish sauce, soy sauce, bagoong, plain salt, and salted fish. Even our instant noodles, chips, and nuts are teeming with salt. According to Dr. Montemayor, it doesn’t matter if you dilute your soup with lots of water. As long as you drink all the soup, you’ll still get all the salt in it. Hence, if you like eating instant noodles, just use half of the seasoning and add half of the water only. The problem with salt is that it encourages the body to retain water, and can increase your blood pressure (which damages the kidneys). Learn to read nutritional labels and limit eating salty foods. 2. Don’t load up on high-protein foods. Did you know that eating too much protein, such as pork and beef meat, can overwork your kidneys? It’s true. Being a kidney specialist and physiology professor, Dr. Montemayor explains that too much protein makes the kidneys work twice as hard. Her analogy is: If the kidney’s usual activity level is similar to a person walking, then taking in too much protein can force the kidneys to be “running” on high gear. Pretty soon, your kidneys could get tired and some of the weaker kidney cells can die. A friendly reminder to people on a high-protein Atkin’s Diet or South Beach Diet: Don’t overwork your kidneys. The time-tested doctor’s advice of moderation in everything will serve you well. Eat a balanced diet of rice, vegetables, fish, and fruits and you can’t go wrong. 3. Keep your blood pressure at 130/80 or lower. If your blood pressure is above 140 over 90, this can cause kidney damage within five years. The kidneys are said to be “happiest” with a blood pressure of 130/80 or lower. To help control your blood pressure, you should limit your salt intake, reduce weight, and take medicines for high blood pressure, if needed. 4. Keep your blood sugar below 120 mg/dl. Diabetes and high blood pressure are the two leading causes of kidney failure. Diabetes affects almost all organs of the body. According to Dr. Montemayor, a person with uncontrolled diabetes for five to 10 years may develop significant kidney damage. Consult your doctor and keep your blood sugar under control with diet, exercise, and maintenance medicines. Our two goals are to have 1) a fasting blood sugar of 120 mg/dl or less, and 2) a hemoglobin A1C test (three-month average blood sugar test) of six percent or less. 5. Drink eight glasses of water a day. Doctors usually advise people to take in eight glasses of water a day, but this really depends on your age and condition. If you’re sweating a lot and work outdoors, you may need to drink more than eight glasses a day. However, if you are above 65 years of age, you may do well with just six glasses a day. Drinking enough water also prevents the formation of kidney stones, a painful condition which, if left untreated, can also lead to kidney failure. 6. Watch your intake of pain relievers and other drugs. Dr. Montemayor says that taking pain relievers like mefenamic acid, ibuprofen, and the coxibs (like celecoxib) for a prolonged period of time may cause kidney damage. Because of this, we should limit taking these medicines to only a week, or just take them as needed. After taking these pain relievers, we need to let our kidneys rest first (from all its running and puffing) before taking the medicines again. For those with chronic arthritis, try to look for other ways to relieve the pain such as using a hot water bag, pain reliever ointments, or the safer paracetamol tablet. Certain antibiotics can also cause kidney damage. Check with your doctor first. 7. Be careful with tests and procedures using contrast dyes. Some tests, like CT acans and MRIs, use a contrast dye which helps doctors delineate the organs better. Many procedures, such as heart angioplasties and some cancer treatments, also use ample amounts of contrast dyes. The problem with such dyes is that they can cause kidney damage, especially in the elderly and those with previous kidney disease. Dr. Montemayor says there are studies, which support the use of fluid loading (200-300 ml orally or through the vein), before such a procedure. Another promising kidney-protecting technique is to take a medicine called Fluimucil (containing N-acetylcysteine) two days before and up to two days after the procedure (as reported in the New England Journal of Medicine, June 29, 2006). To be safe, I would strongly advise you to consult a kidney specialist before undergoing such procedures. 8. Don’t take too much vitamin C.
Some patients are fond of taking high doses of vitamin C, such as in the 2,000mg range. However, Dr. Montemayor warns patients against using such high doses. Too much vitamin C (ascorbic acid) can lead to the formation of kidney stones in predisposed individuals. If you need to take vitamin C, a dose of 500mg or less is safer. 9. Don’t rely on food supplements to protect your kidneys. According to Dr. Montemayor, there is still no food supplement that has been scientifically proven to protect the kidneys. 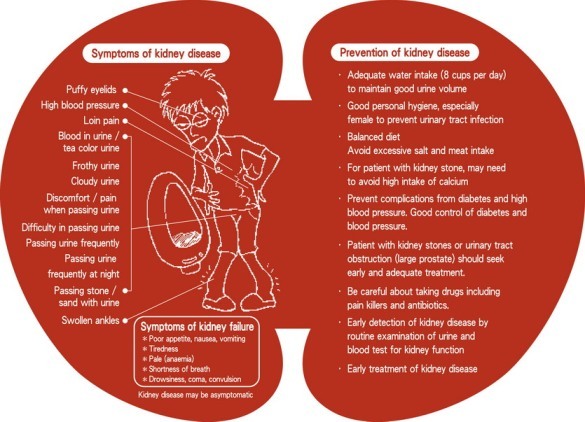 The above tips are so far the best tips to care for the kidneys. 10. Get a kidney check-up. Simple tests, such as a complete blood count, BUN, creatinine, and a urinalysis are the first screening tests for the kidneys. Finding a trace of protein in the urine can alert the doctor of possible kidney disease. Patients with diabetes and high blood pressure should also be checked for early kidney disease. Bottomline is: Kidney diseases are expensive and difficult to treat. Let’s take the necessary steps to protect our kidneys today. You can compare Dr Ong's 10 ways to protect your kidneys with the 10 ways recommended by the National Kidney Foundation, USA. Thank you for posting my article and for your kind comments. If it will help your readers, you may post my other articles or videos as you wish. God bless and take care. Good advice especially on health should be shared. Thank you for doing just that with your articles and videos, Dr Willie. This is true community service that comes from a kind heart. God bless. tQVM for this post of taking care of kidney which is just as important of taking care of the heart. Have to live in moderation.